There's a brilliant simplicity to first-past-the-post. You walk into a polling booth, put a cross against someone's name, drop the paper in a ballot box - and the person who gets the most votes wins. That goes out the window with AV. ...and redistributing votes until someone gets fifty percent. But it's a lot more complicated than that. "As the process continues the preferences allocated to the remaining candidates may not be the second choices of those electors whose first-choice candidates have been eliminated. It may be that after three candidates have been eliminated, say, when a fourth candidate is removed from the contest one of the electors who gave her first preference to him gave her second, third and fourth preferences to the three other candidates who have already been eliminated, so her fifth preference is then allocated to one of the remaining candidates." I didn't. And I've read it many times. And I don't think we should replace a system that everyone gets with one that's only understood by a handful of elites. Shouldn't I be worried that my Prime Minister doesn't understand how the relatively simple AV system works when he makes hundreds (if not thousands) of complicated decisions? He apparently came bottom in Latin and Maths at Heatherdown, an exclusive preparatory school, so I guess logic might not be a strong point. AV isn't particularly difficult to understand. Personally, I think I'd prefer STV, but at least this is a step in the right direction. I've only paid the deposit so far, but I should be picking up my new car on Saturday morning. My mum will probably think I'm foolish and reckless (I'm debating not telling her), but you only live once, and I'm viewing it as an early 30th birthday present. It's about time I treated myself. For more pics, try to imagine these in a nice dark blue, like in the photo above. 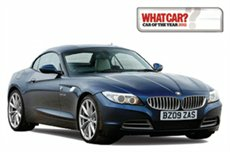 So how does the Z4 compare to my Mondeo? It's half a metre shorter, it's almost twice as fast. It's an 09 plate so it's 4 years newer (and if I stick a personalised number plate on it at some point, I'm sure I can talk work into letting me keep the Z4 for at least the next 5 years), and has only done just over 10000 miles. As a bonus, the fuel consumption isn't too different to my Mondeo! The combined mpg is only 4 lower. The emissions aren't much higher either, falling into the same band of J, so even that'll cost exactly the same. The Mondeo has a much bigger boot and can take more people, but I usually just have a backpack in the boot and I mostly drive by myself. So I'm basically buying a car that's smaller, faster, newer, roughly the same running costs (although services will probably cost more, and insurance is understandably around twice the price). I gain leather, heated, adjustable (with memory) sport seats. I finally have parking sensors (front and rear). The (tiny) rear windows are electric instead of manual. It's also a really pretty car (the exact same specification would cost over £38k for a brand new version). Sure, there are a lot of other cars I could have bought; but I don't think I'll ever regret my decision. Feel free to ask me in 2-3 years time.